The women’s Anon Deringer goggle offers a sleek profile with an oversized field of view. It features Magnetic Facemask Integration (MFI®) that seals the included Anon MFI facemask to the goggle in a snap. Women’s-specific design ensures the best possible fit and comfort. Cylindrical Lens Technology provides maximum field of vision, while SONAR lens technology by ZEISS enhances contrast for the best possible definition and terrain recognition. Full perimeter channel venting ensures maximum airflow for clear, fog-free vision in all conditions. The Deringer goggle is Over the Glasses (OTG) compatible for wearing with eyeglasses. 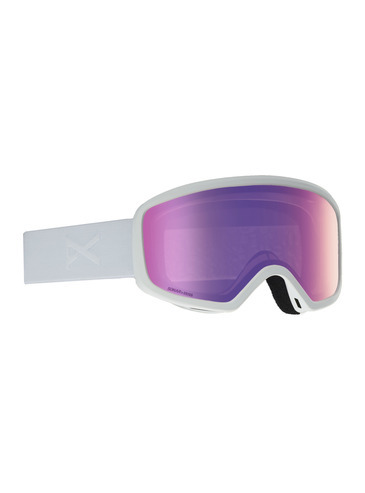 Includes MFI facemask, spare Amber tinted lens for cloudy conditions, and a microfiber goggle bag for storage and wiping the lenses clean.